Woodturning demonstration and talk by Dennis Hales, Woodturner of Stalham. Dennis Hales is a professional turner who works with locally grown sycamore, holly, ash and maple. The white woods offer a natural canvas on which he incorporates a wide range of finishing techniques. He uses turned, carved, textured surfaces, finished with water soluble dyes and metal leaf, to enhance the natural features of the wood whilst achieving a sympathetic balance of form and finish. 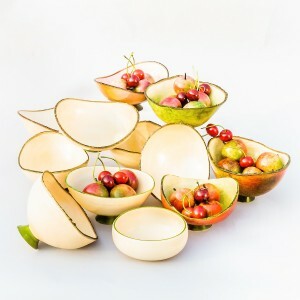 Dennis’s work includes fruit displays, Sycamore bowls embellished with silver leaf and wall plates of ash and copper. For more information see Dennis Hales’ website. For full event details, see our events page.